Military history is in no way my forte. Yet involuntarily I get rather often in touch with traces of the military past when walking around Utrecht. 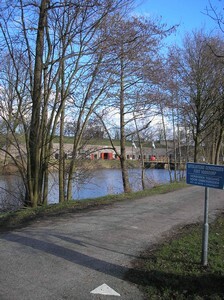 North and east of Utrecht are a number of forts that belong to the former Nieuwe Hollandse Waterlinie, the “New Dutch Water Defense Line” which stretched from Amsterdam via Utrecht to the Lek branch of the Rhine. In war time a number of polders would be inundated; the weakest points in the defense line were protected by fortifications. Some forts are quite small, nothing more than just one central bomb free building surrounded by earthen walls and water, others are large. Fort Rijnauwen, the largest fort, has an area of 31 hectare. The forts have long lost their military importance. The Ministry of Defense still possesses a number of the forts built during the 19th and 20th century, but a growing number has been transferred to all kind of institutions. The former Fort Hoofddijk is now the main centre of the botanical gardens of Utrecht University, and also home to its paleomagnetic laboratory. One aspect of the forts has a connection with legal history: according to the Kringenwet (“Zone Law”) of 1853 the area around the forts was divided into three zones. In the inner zone building with brick was only allowed to a height of 50 cm. Buildings in the outer zone could be made of brick, but in war time they could be demolished without warning and without any right for compensation. The outer perimeter was one kilometer. In effect it meant that the city of Utrecht could not start building large new suburbs north and east of the old city. Only in 1951 this law against brick buildings was mitigated, and in 1963 finally abolished. As a result building progress on this side of Utrecht started belatedly. On the northern limit of Utrecht the zone around the forts is still relatively empty. The relative calm around the forts provided birds and plants with a safe habitat. I remember visiting Fort Rijnauwen in the seventies looking for birds, and it is fittingly protected nowadays by Staatsbosbeheer, the National Forest Service. Today I walked to three of the forts in my vicinity. Fort Blauwkapel is perhaps the most curious fort: it encloses within its walls a tiny village. The small fortification shown here dates from around 1850. Its restoration was completed in 2009. A scouting group uses this building. Fort Voordorp has become a party center. There are few neighbors within hearing distance… Notice the two traffic signs at the right: this place is again forbidden to the general public! Only the lower one is legally enforceable and would suffice. Fort Ruigenhoek and its main building from 1870 is not just home to a colony of bats, but hosts every summer KAAP, a manifestation of modern art. In 1996 the fortifications around Amsterdam were added to the UNESCO World Heritage List, but the forts around Utrecht are every bit as interesting. Fort Vechten has been chosen as the location of a new center for the history of the water defense line. This fort is located near the archaeological site of the Roman castrum Fectio, a part of the limes in the area along the Rhine estuary. Here Roman and recent history touch each other. This entry was posted in Buildings, Landscapes and tagged Legal history, Netherlands, Utrecht on March 2, 2010 by rechtsgeschiedenis. We got married in Naarden-Vesting, otherwise known as the mother of all forts. Could you say something about that? Thanks in advance. 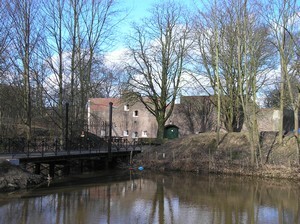 The town of Naarden got fortifications already in the sixteenth century. A map by Jacob van Deventer from 1560 shows their first form, but this city defense yet lacked the typical elements of the star fort introduced by Italian architects. Naarden was one of the keys in the seventeenth century Dutch defense line. Only in 1685 the city got the fortifications now still present. 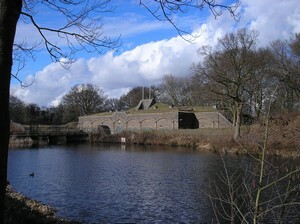 In the nineteenth century Naarden became a part of the New Dutch Water Defense Line. On the old fortifications new bomb free shelters were built and earthen walls added; on the west side of town Fort Ronduit was built. Thus Naarden was already a fortified city before the nineteenth century.